This also means that they were living in Cork city from 1862. James was only 18 at the time and Mary 22. Because there is no mention of who the parents were, no address, occupation… I wonder if they eloped. In those days travel by cart from Dunmanway would have taken many many hours. You will notice that Crowley was spelled as Crowly. This was the common English spelling in the 19th century. But even with the Irish surname Ó Cruadhlaoich the spelling was previously Ó Cruadhlaoigh and my grandfather Jimmy (1903) told me that if I had to use my Irish name, then I should spell it with a ‘g’. Ó Cruadhlaoich and Crowley are the official spelling. Bill’s son Eamonn found these records and I would really like to thank him for sharing these. You can view these records on our website. 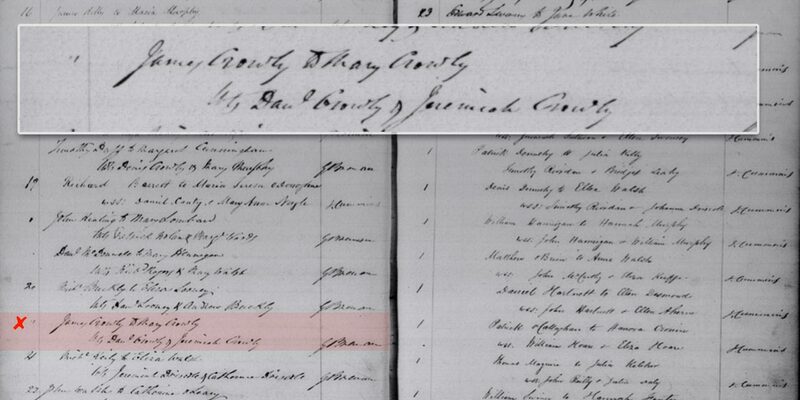 Online record: “Marriage of James Crowly and Mary Crowly on 20 February 1862“. PDF of original file Wedding certificate of James and Mary.